Season 7 was an epic season for dragons. Especially when Viserion, Rhaegal and Drogon and Daenerys attempt to rescue Jon Snow and the rest of the Night’s watch from the huge army of the White Walkers. During the battle the Night King is handed an ice spear and hurls it at Viserion. By some magic power, it pierces the Viserion’s neck. The dragon dies, I’m so sad!!! 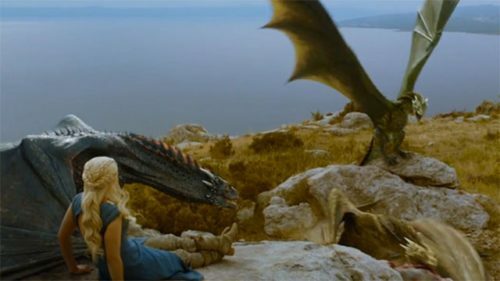 But Viserion falls out of the sky with Daenery’s on his back. They crash through a frozen lake and sinks beneath the water. 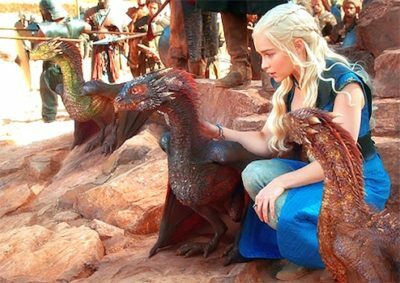 Daenery’s is rescued but she’s heartbroken over losing one of her baby dragons. It’s soooo sad!! 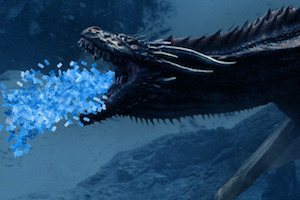 Spoiler alert, later the Night King resurrects Viserion out of the frozen water and he transforms into an Ice Dragon. His body is like ice, greyish and eyes glowing the same blue colour as all the White Walkers. He is now ridden and controlled by the Night King. You can see in the epic finale of Season 7 where the Ice Dragon formerly Viserion totally destroys the wall protecting the Seven Kingdoms. It’s truly a sad moment. But the scene is so amazing. Find Game of Thrones Viserion Ice Dragon costume ideas below. 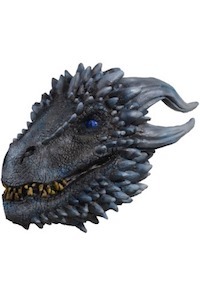 This officially licensed latex mask will transform your noggin into the terrifying look of the undead dragon that proved to be one of the biggest plot twists in the whole story. With shining blue eyes and the mottling horns and spines, this dragon is bound to turn some heads. 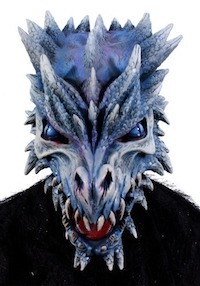 Click here to get the White Walker Viserion Ice Dragon Mask. 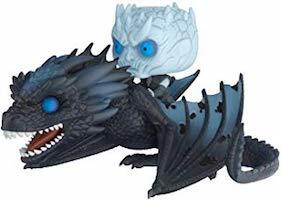 Click here to get the Funko Pop collectible Game of Thrones Night King riding the Ice dragon.